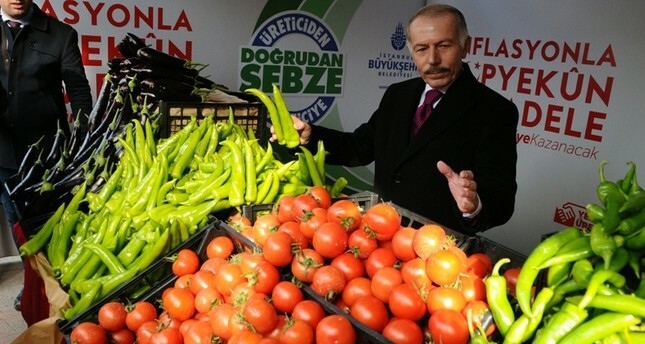 Municipal direct sales points for fruits and vegetables, which aim to eliminate middlemen between producers and customers, started operating Monday in 50 venues in Istanbul and 15 venues in Ankara. The initiative began after President Recep Tayyip Erdoğan and other members of the cabinet vowed to slash the increase in food prices – the main component of Turkey's rampant inflation rate that stood at 20.3 percent in 2018 – which is partly blamed on profiteers and stockers. Erdoğan said Sunday that the rise in food prices has turned into a tool of exploitation against citizens, promising to stop those who "terrorize" wholesale markets. Trade Minister Ruhsar Pekcan also said Sunday that they have detected price increases of over 800 percent between purchases from producers and sales to customers. Pekcan added that 88 firms were fined over TL 2 million. According to a statement from the Istanbul Metropolitan Municipality (IBB), the 50 sales points started their operations in central locations of the province's 34 urban districts. The sales points, which will begin by selling seven vegetables, will be open for service throughout the week between 10 a.m. to 7 p.m. Sales points will not be launched in Adalar, Arnavutköy, Çatalca, Silivri and Şile districts since these districts still have a large amount of agricultural production. IBB General Secretary Hayri Baraçlı said that the foodstuffs, procured from agricultural cooperatives from various regions, will be provided as long as there is demand from citizens and that necessary measures for logistics have been taken. He added that there will be a purchase limit of 3 kilograms per item since these points do not carry out wholesales and aim to reach as many people as possible. The IBB's sales points will use paper or cloth bags as part of the country's latest drive to curb the use of plastic bags. Ankara Metropolitan Municipality (ABB) also said in a statement that the number of sales points will soon be increased to 30. The prices in Ankara are significantly lower than the Turkey average in January calculated by the Turkish Statistical Institute (TurkStat). Accordingly, 1 kilogram of onions is be sold for TL 2 at Ankara direct sales points, compared to the January average of TL 4.9. For tomatoes, 1 kilogram is sold for TL 3, half of the average price of TL 6.
Credit cards and debit cards will be accepted at sales points in both cities. The move from the municipalities is also important as the TurkStat has recently updated its method of calculating the inflation rate, and the share of food and nonalcoholic drinks is now more prominent. TurkStat data showed that the increase in the same category was 6.43 percent in January, which could push the year-end food inflation rate to 31 percent if current trends continue, significantly higher than the Central Bank of the Republic of Turkey's (CBRT) target of 13 percent. Increasing fuel and fertilizer costs triggered by the slump of the Turkish lira, decreasing production, rising number and intensity of natural disasters, and lack of action to regulate the market are often cited as the main causes of high food prices. The municipal sales points were common in Turkey in the 1960s and 1970s, when the country had not been introduced to the supermarket concept. Especially in the 1970s, these points proved vital for the country's urban population due to shortages in consumer goods amid political turmoil caused by violent and armed clashes between far-right and far-left groups and a collapsing economy. One of the most renowned of these municipal sales points was Tansaş, a mix of Turkish words "tanzim" (organize) and "satış (sales), which are currently being used to refer to municipal sales points. Tansaş was established in the western province of Izmir in the early 1970s as a municipal directorate and registered as a company in 1986 to operate as a supermarket chain. Quickly becoming one of the largest retailers in the Aegean region, it was partially privatized later in the late 1990s and adopted a nationwide strategy. It was wholly acquired by retailer Migros in 2005, re-positioned as a regional brand in early 2010s, and the brand was later discontinued altogether.